Today I want to point you in the direction of a super accessible local park that you may not have heard too much about. 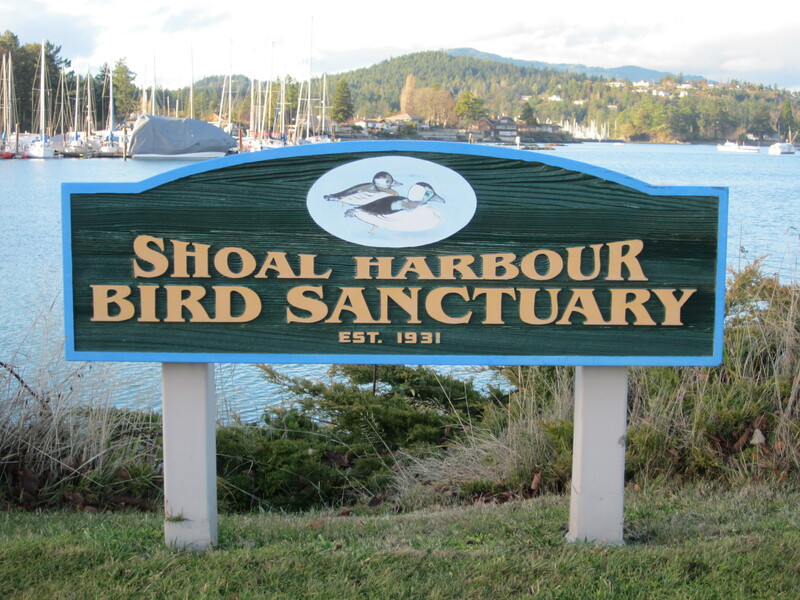 Shoal Harbour Bird Sanctuary is right in downtown Sidney, and while definitely an urban park rather than a wilderness one, it boasts some pretty fantastic ocean vistas. My favourite way to check out the view and the birds there is to head out onto Resthaven Island, a little point of land that’s separated from the mainland by an itty bitty channel (and joined by a short and sturdy two-lane bridge). There’s a well-maintained loop trail there – it’s actually a municipal park, a narrow one that skirts the edge of the island. The park is called, remarkably enough, Resthaven Linear Park. 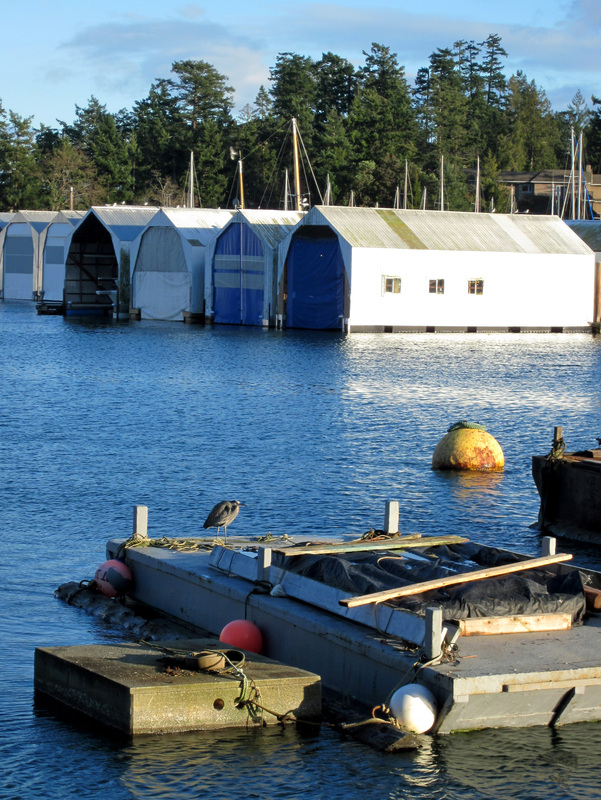 It’s a great place to birdwatch, and with all the marinas close by (there’s Van Isle and Shoal Harbour Marina on one side, and Capital City Yacht Club and North Saanich Marina on the other) it’s also an excellent spot for boat-ogling, if you’re into that sort of thing. The area around Resthaven Island is part of the Shoal Harbour Migratory Bird Sanctuary, a 143-hectare federally protected sanctuary. It was awarded this designation in 1931, making it one of Canada’s oldest migratory bird sanctuaries. Many different species of birds frequent the area – in addition to a number of Canada Geese and Mallards, you’ll often see Common Loons, Buffleheads (more about these guys below!) and Hooded Mergansers further out in the bay. There’s a good chance you’ll see a Double-crested Cormorant or two sunning themselves on nearby wood pilings, and if you keep a sharp eye out you’ll likely find Black Oystercatchers or Killdeer poking around on the shoreline. Shoal Harbour Sanctuary provides ecological, scientific, social, cultural, educational, and economic benefits to the community in various ways, including maintenance of biological diversity and ecological processes, providing outdoor recreation opportunities with scenic vistas, creating a sense of place for residents, an opportunity to learn about the local environment, to monitor long-term changes in the environment, and to enhance the region’s economy through tourism. In doing a little digging around for this post, I found a further example of the significance of these charismatic birds to our local history and culture. It turns out the Town of Sidney has an official Coat of Arms – granted and sealed by the Chief Herald of Canada, of the Canadian Heraldic Authority. (Who knew? I sure didn’t!). Anyway, prominently featured on this coat of arms, pictured on the right, are a pair of Buffleheads. The first version – sans ducks – was designed by Professor A.L.C. 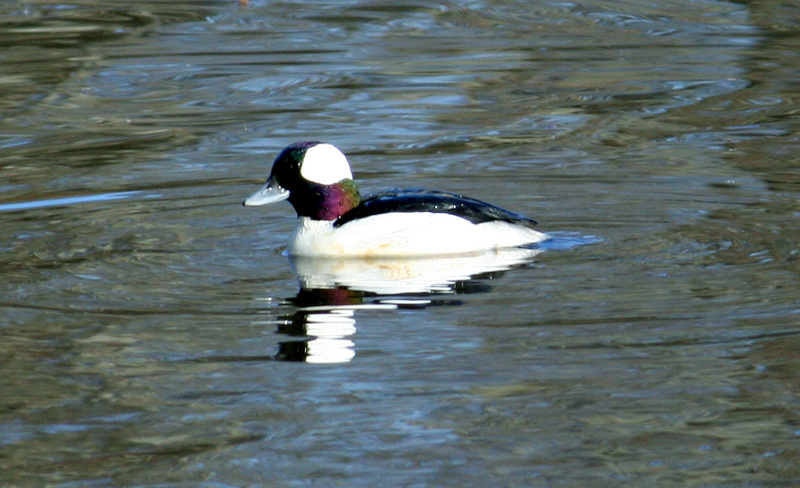 Atkinson in 1969, but in 1995 the Environment Advisory Committee suggested the addition of both Buffleheads and Arbutus leaves to highlight the unique features of Sidney’s natural environment. So there’s an odd little piece of local trivia for you! Spot the Resident Great Blue Heron! 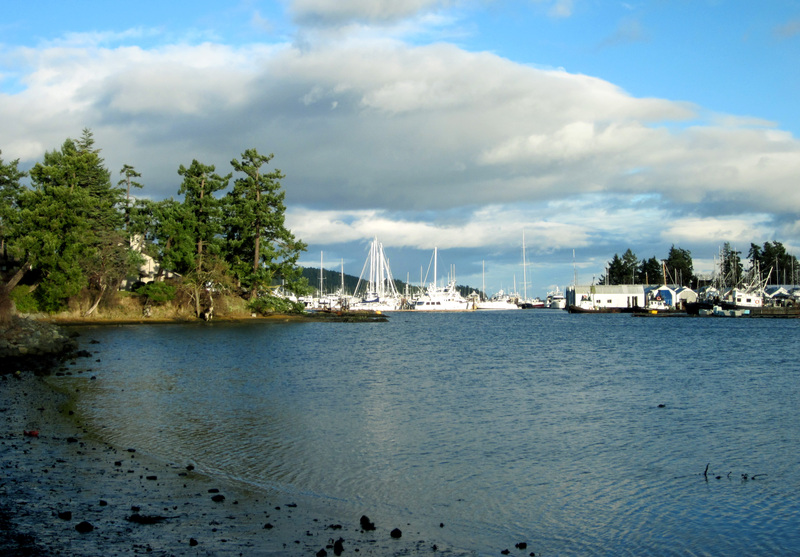 For such a little park Shoal Harbour houses some great plant life, including several surprisingly tall Douglas-firs and several lovely Arbutus that lean out over the water and look absolutely spectacular in the warm light of the setting sun. There is a beautiful rocky outcropping at the end of the point on Resthaven Island with a small gazebo and a comfy bench – the perfect spot to relax and enjoy the beauty of the harbour. Last but not least, keep an eye out for the resident Great Blue Heron – it generally prefers to hang out on quieter docks or a rocky outcropping, waiting for the perfect snack-sized fish to swim by. All in all this is a great little park to visit if you’re in the neighbourhood. It’s a quick walk around the island – maybe 20 minutes if you’re sauntering along – but for such a small urban park it packs a good punch of wildlife and scenery. The best way to access this tiny park is through the little parking lot at 10440 Resthaven Drive. If you’re taking transit instead, there’s a convenient bus stop right at the entrance to the park on the 70, 72, and 81 routes. Heather, Thanks for the LIKE. Came by your site. I really like your photos. I have a really cool closeup of a Condor if you’re interested. Hi Tom! Thanks for the visit and for checking out my photos. I’d love to see your shot of a Condor – I’ve never seen one in the wild before! Check your inbox. Hopefully I had the correct email.